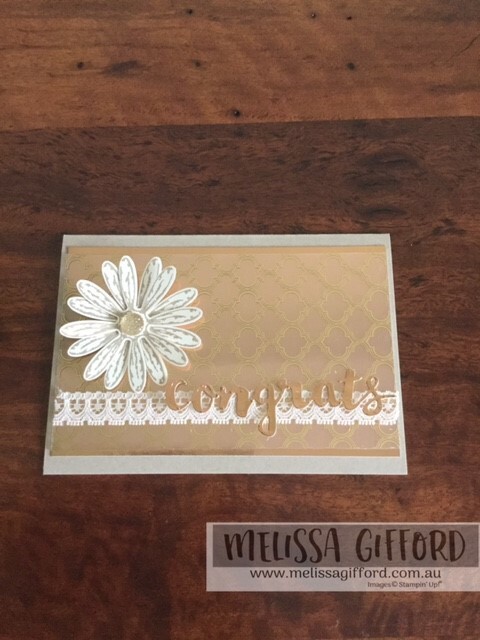 A few weeks ago one of my team members, Kylie hit a big Stampin' Up! milestone - she promoted to a new title called Bronze Elite. To celebrate I wanted to make a handmade card in bronze colours. I also sent her a little gift. It was hard to get a good picture in this rainy, overcast weather and not catch the glare! It's really shiny in real life. I reached for the copper foil sheets and and went from there. I used crumb cake as my base, added some copper foil, layered it with a piece of retired patterned window sheet. I then added the daisy and the congrats die from the sunshine wishes thinlits dies. I thought the vanilla lace trim added some nice texture and gave it a bit of a vintage look. There is no hard sell, no pressure to hold classes or workshops, it's totally up to you. You can sign up just for the discount and that's totally ok! Please contact me if you have any questions.